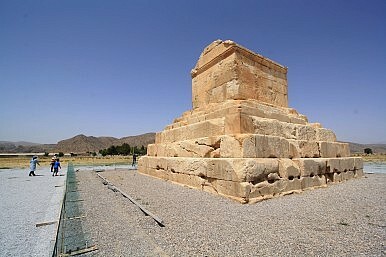 2,500 years after his death, Cyrus the Great’s tomb in Iran remains a site of mystery and wonder. The Smithsonian’s Sackler Gallery of Asian Art in Washington D.C. has just launched a new exhibit on the discovery and excavation of the ancient Achaemenid Persian capital of Pasargadae. As relations between the United States and Iran continue to thaw, this is yet another opportunity for Americans to learn more about a culturally rich country that has too often been portrayed in a negative angle in the Western media. From February 13 to July 31, the museum will exhibit Heart of an Empire: Herzfeld’s Discovery of Pasargadae. Ernst Herzfeld (1879-1948) was a German archaeologist who first excavated Pasargadae, located not too far from the Iranian city of Shiraz, and confirmed that it was the site of the tomb of the founder of the Persian Empire, Cyrus the Great (who reigned from 559 to 530 BCE). Darius the Great (520-486 BCE) moved the capital to the more well-known Persepolis. It is particularly amazing that the tomb of Cyrus still survives whole, after over 2,500 years, despite some damage and neglect. Meanwhile, the city around the tomb has mostly crumbled to ruins. The Sackler Gallery contains some of the world’s largest materials on Pasargadae. Located in the dasht-i murghab, or “plain of the water bird,” in Fars province, it was first surveyed by Herzfeld in 1905. He then completed his PhD thesis on Pasargadae in 1907 and conducted extensive excavations in 1923-1928. Herzfeld was definitely not the first to discover or make note of the site, but was the first to confirm that the site was actually an imperial Persian capital and the location of the tomb of Cyrus, the existence of which was posited by the Roman historian Arrian, but was lost to Persian histories. The famous Persian epic, the Shahnameh does not seem to have a historical memory of Cyrus (though there are many of his inscriptions in Iran), but seems to conflate his deeds with those of legendary characters. It is astounding that until recently, the Persians, like the modern Egyptians, and many others, forgot so much of their ancient history that it took a European to identify and discover famous archaeological sites in those regions. Indeed, most of the major discoveries of ancient civilizations throughout Iran, Iraq, Egypt, Syria, Saudi Arabia, and Turkey were made by Western archaeologists. Granted that it was in the West that modern, systematic, scientific archaeology developed, there is still a strong case to be made for the people of the Middle East to cherish, advertise, protect, and research their ancient heritage better. However, knowledge of Pasargadae may have been lost due to the uncontrollable vagaries of history rather than any deliberate cause. While Arrian had claimed the tomb contained the inscription, “Passer-by, I am Cyrus, who gave the Persians an empire, and was king of Asia/Grudge me not therefore this monument,” no such words were found. Instead, the words “I am Cyrus, the king, an Achaemenid,” were found carved into a nearby column in three languages: Old Persian, Elamite, and Akkadian. The tomb was then ransacked during the conquests of Alexander the Great, who was furious at this act of sacrilege, as he admired Cyrus. Indeed, Cyrus was one of the most admired individuals of ancient times because he allowed all people to conduct their own affairs with autonomy and ruled his empire benevolently with a generous hand. Babylonian documents, Greek sources, and the Old Testament all praise him. Knowledge of the tomb was forgotten during the Parthian Empire, which originated in today’s Turkmenistan, that followed soon after Greek rule. During the Islamic conquests of Iran, the Arabs came to believe that it was the tomb of Solomon’s mother and in the 13th century, a mosque (which is mostly gone now) was built around it. Travelers speculated on its purpose, but nothing was proven conclusively until the 20th century. However, once discovered, it was quickly appropriated and promoted by the late Shah, Mohammad Reza Pahlavi, who sought to glorify pre-Islamic Iran. He personally went to the tomb on October 12, 1971, to pay his respects during the 2,500 year celebration of the Persian Empire. A visit to the Sackler Gallery, which always features new and interesting exhibits, is worth a visit if one is interested in learning more about Pasargadae or in understanding the archaeology behind it. How did modern Anatolia come to be occupied by the Turks? The historical story may surprise you.